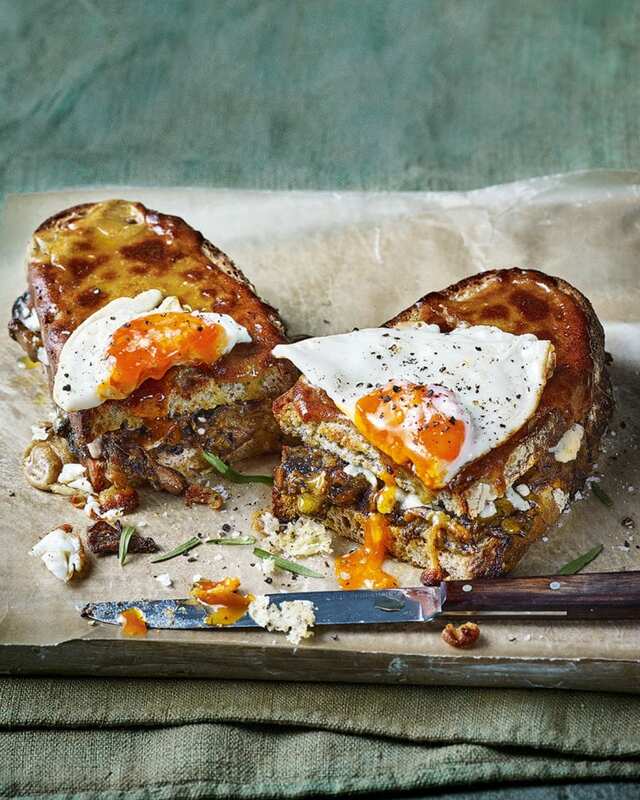 We’ve put an updated twist on Welsh rarebit with this mushroom, tarragon and fried egg toastie. Although we’ve used cheddar in the sauce, feel free to use any cheese you like. Blue cheese would make a tangy addition or try gruyère for a mellower flavour. Heat the grill to medium. For the rarebit sauce, put the cheeses, cornflour, stout and mustard in a small pan, then whisk over a medium heat until the cheese has melted and the sauce is smooth. Take off the heat, whisk in a few dashes of Henderson’s Relish and the egg yolks, then return to a low heat to thicken slightly. Set aside (or see Make Ahead). Heat a knob of butter in a large heavy-based frying pan and fry the mushrooms for 5-6 minutes until cooked through and golden. Pour in two thirds of the rarebit sauce and add most of the tarragon. Stir and season with black pepper. Lightly toast the bread on both sides under the grill. Put 2 slices on a baking sheet, divide the mushroom mixture between them, then top with the remaining slices of bread. Press down, then spread the remaining rarebit mixture on top of each sandwich. Heat the oil in a frying pan, then fry the eggs to your liking. Season with salt and pepper. Meanwhile, grill the sandwiches until the tops are golden brown and the centres are oozing. Serve each toastie topped with a fried egg and the rest of the tarragon and eat with a green bitter leaf salad, if you like. Use any cheese you like. Add a little crumbly blue cheese for extra kick. Keep the rarebit sauce mixture in the fridge with a piece of cling film touching the surface for up to 2 days. a simple Pays d’Oc pinot noir.